Gooseberries grow on bushes. They are very hardy and have been grown in gardens for hundreds of years. Gooseberries have great nutritional value having twenty times as much Vitamin C as an orange! They are also a good source of Vitamin A, manganese and dietary fibre. Locality – Each variety of gooseberry behaves differently in another part of the country, so it is important to ask local nurseries, gardening enthusiasts and garden centres what they recommend for your area. If you are tempted by a particular variety, ask if that has a good reputation in the area. Time of Harvest – are there times when you will not able to pick the fruit, because you are away? The variety Whinham’s Industry will be ready in August, during the school holidays, so it is better to choose an earlier fruiting gooseberry for a school garden. Invicta starts to fruit in early June, and Leveller gooseberries will be ready from late June to mid-July. Prickles – The variety Invicta has lots of strong thorns and is very prickly, so it is not suitable for children to harvest. Even if they wear gloves for picking, their arms will be scratched. But Invicta is very productive, so it may be worth including with other bushes. The variety Pax is thornless and easy for children to pick. Dessert or Cooking – Most people pick gooseberries for cooking, to make pies or gooseberry fool. But some varieties, like Hinnonmaki RED and Captivator, produce softer, sweeter berries which can be eaten straight off the bush. Disease Resistance – it makes sense to grow a variety which is resistant to Mildew, such as Invicta and Leveller. In a Raised Bed – although it will take up a lot of room! Plant in late autumn or early spring, if the soil is not frozen or waterlogged. Space bushes about 1.5m apart. Prepare the soil by adding compost or other organic matter and digging well. The hole for the roots must be twice as deep as the roots and twice as wide. Fill the bottom half of the hole with well structured soil and spread the roots out as you cover them with soil. Press the soil down well with your heel and water the plants in. Look for the soil mark on the trunk, so that the bushes are planted at the same depth as they previously were. Water well. Mulch – cover the ground under the bush canopy with organic matter to stop the plants drying out & to prevent weed growth. Feed – apply a handful of a general fertiliser in late winter. 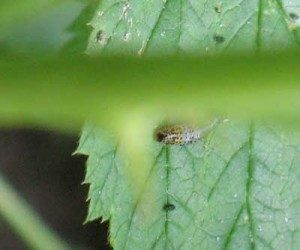 Check for Caterpillars – look out for pale green Sawfly Caterpillars between May and September. Look right in the center of the bush, and if leaves are missing, there will be some tiny caterpillars. By the time the outside leaves are being eaten, there will be a big infestation! It really does make a difference if you pick the caterpillars off as soon as you see them. A daily check works wonders. 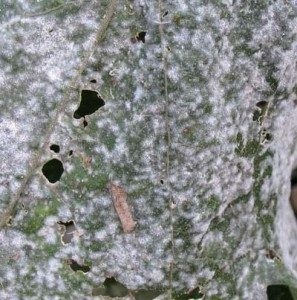 Mildew – the other common pest if the fungal disease called Mildew. 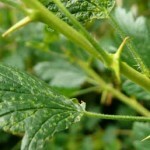 A powdery, white coating appears on new shoots, spreading to young leaves and, eventually, the berries. Later these patches form a felt-like mat and turn brown. Leaves curl up and fall off. Look for signs in the spring and cut out any infected shoots. The main problem is humidity, so like avoiding athletes foot, keep the area dry, allowing plenty of air to circulate. Follow the tips in our article on Mildew. Prune the gooseberry bushes to keep them open and airy. Water pot grown plants very regularly so that they never dry out. Water the soil, not the leaves, to reduce the chance of Mildew. Harvesting usually starts in late May – before the gooseberries are fully ripe. The first picked gooseberries are hard and tart; these are used for cooking crumbles, pies and tarts. If the gooseberries start to fall of the bush, they need picking. 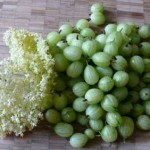 Elderflowers combine well with gooseberries. Gooseberry and elderflower jam is a good way to use up the surplus produce, and it sells well at the autumn fair! 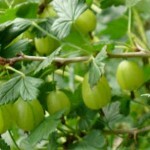 Gooseberries are very easy to grow as they are vigorous and hardy. With a little TLC to avoid caterpillars and mildew, gooseberries are very rewarding.